My Back 40 (Feet): Bloom Day! Suddenly, it's Bloom Day! How did that happen? There is not much blooming in the garden, but a couple things that are blooming are doing so prolifically. I am going to drive that point home by showing you multiple pictures of the same plant. I worried a little bit when Tithonia diversifolia started to bloom in October. Did that mean it wouldn't bloom in December and January? Apparently, no. The subtle chocolate scent from the flowers is nice if you remember to sniff for it. They do a pretty good job holding up in the vase too. They last a week for me. I don't know what it's like in the vase. 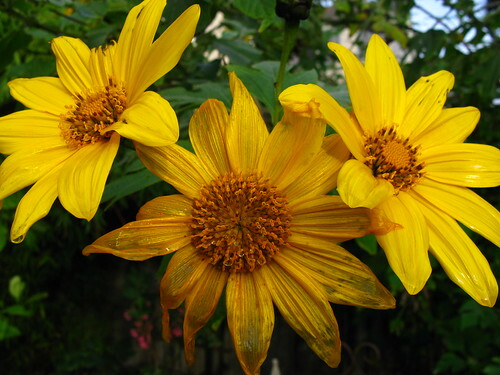 This plant is even more florific than than Tithonia, although I seem to have taken the same picture twice. 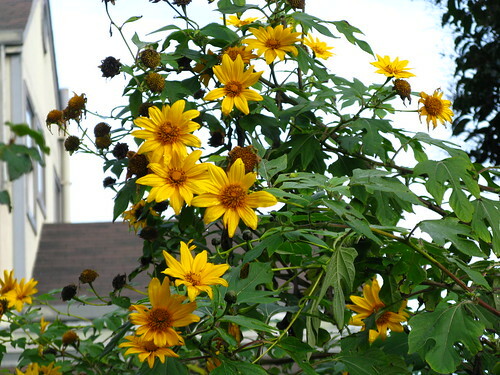 Elsewhere there are stray blooms. 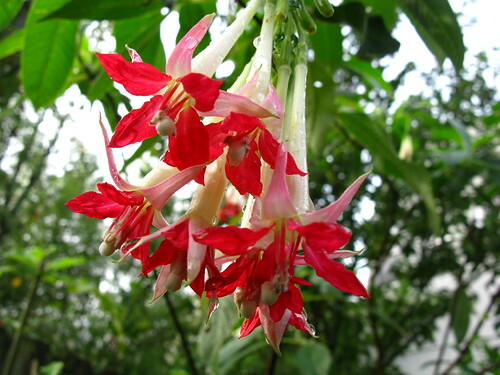 Fuchsia boliviana 'Alba' has candy-cane colors, doesn't it. 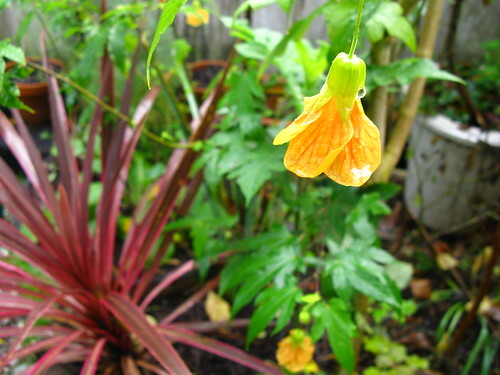 I can always find Abutilon flowers. This is one of the oldest plants in my garden. I've moved it many times, but it's going to stay here with the cordyline from now on. 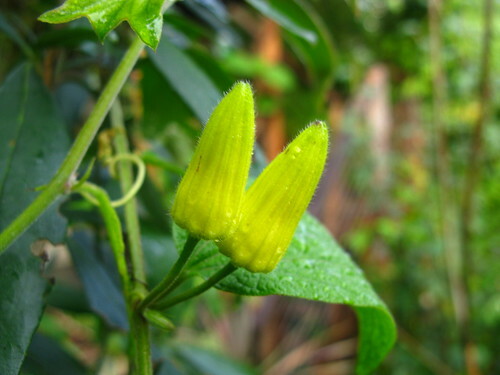 Passiflora citrina promises future flowers. Imminent flowers, really. If Bloom Day was tomorrow, we'd have a bloom. That will do it for me this month. You can visit May Dreams Gardens in Indiana for much more. Hi Chuck, I love seeing your blooms. What a delightful plant the Tithonia is, I hope you sniff it often. BTW, your follow me on twitter link isn't working properly, for me anyway. 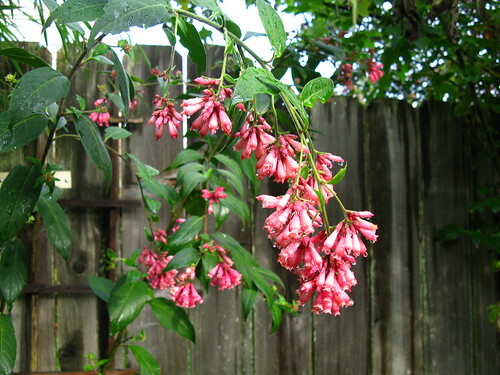 I always hate it when the rain knocks my plants out of shape, but somehow your Cestrum looks as if it belongs that way. Love that Tithonia! I need more yellow in my garden... As for Albutilon, I wacked mine to the ground to make it a small tree, we'll see how that will work out. 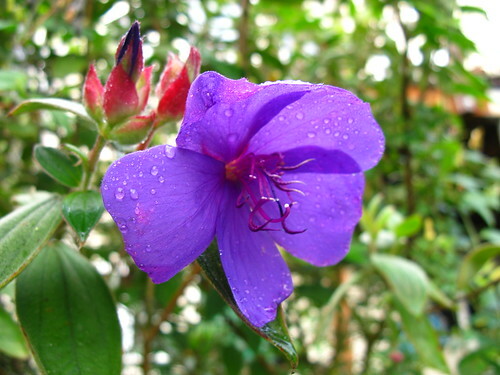 Gorgeous plants, a few I hadn't heard of. 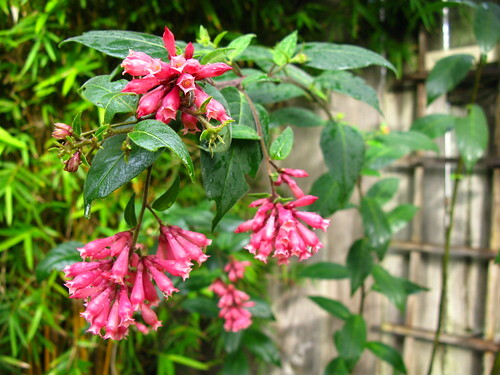 I love fuchsia! But no way it can survive a Houston summer. I saw a great collection this past summer at the South Coast Botanic Gardens near LA. Ooh, I think we have similar taste in flowers, but mine are all asleep right now. 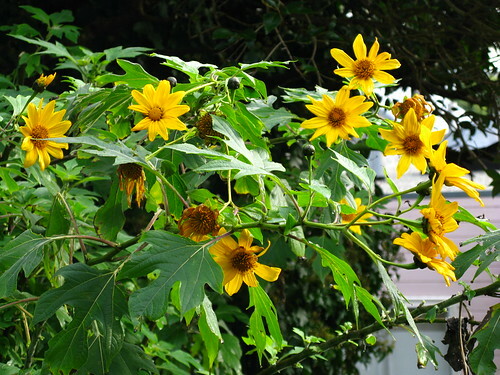 I love your abutilon, fuchsia, and tithonia!